Normally in stock, more are on the way and should arrive within 1 - 2 weeks. Many fabrics and materials used in scenery and costumes are delicate and have a gentle hand and soft drape. Treating these fabrics presents a challenge to develop an adequate flame retardance without causing the materials to stiffen or otherwise alter their drape. 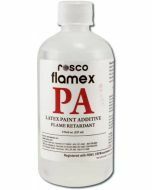 Roscoflamex DF is a gentle solution that maintains the soft qualities of the fabric while still providing a safe and secure flame treatment. 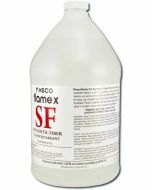 Roscoflamex DF works with most natural or synthetic fiber fabrics. 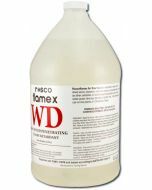 UsageRoscoflamex DF has been premixed and does not require any further dilution. The method of application and the amount of Roscoflamex DF required for sufficient treatment varies with the fabrics in use. DippingThis is the most efficient method of impregnation. Immerse completely for ten minutes, and hang to dry. BrushingUsing a wide lay-in brush, brush the Flamex solution into the fibers of the material being treated. Brush in the solution using a criss-crossing pattern to insure adequate absorption. 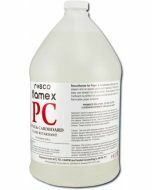 SprayingIn a spray application, it is very important that an adequate amount of the Flamex be absorbed. In calculating the amount of solution needed, remember that a substantial portion of the spray will not fall on the fabric. Use a Hudson-type sprayer with a medium nozzle setting. For best results, hang the material to be treated and spray in a back and forth pattern starting at the bottom and working your way up to the top of the fabric sample. Over saturating the fabric may cause it to stiffen or otherwise alter its hand. ALWAYS treat a test sample to determine how the fabric will react and to test for effective flame retardance. Certification and TestingRoscoflamex DF has been approved for use by the California and New York City Fire Marshall and has been tested according to NFPA 701. StorageStore Flamex products in non-metallic containers. When metal sprayers are used, they should be thoroughly cleaned immediately after use, including nozzles and accessories. Avoid use of metal buckets or paint containers when possible. DisclaimerRead carefully the instructions supplied with any Flamex product. Rosco offers these products in good faith, but without guarantee of any type, since materials treated and methods of application are beyond the control of the manufacturer. You should determine suitability of the Flamex product for the intended use and always test before using. All technical data, recommendations and service are accurate to the best of our knowledge. Rosco/Musson assumes no responsibility for the results obtained or damage incurred from use by the buyer in whole or in part since method of application and its use is beyond our control. 6.13" x 6.13" x 11.8"